After all that Chocolate overdose,how about having something healthy?Ragi/Finger millet flour is something which became my friend very recently.Some time back,I used to associate Ragi only with Ragi Muddo,which obviously I am not very fond of.But of late I've started using it quite regularly in my cooking. Once while in Bangalore,we were having dosas for breakfast.Everyone finished their breakfast and as me and ma-in-law sat down to have dosas,I noticed that the pristine white dosas had turned a pale chocolate color.There was absolutely no difference in taste though.I was intrigued and asked her what was the secret ingredient was and..yes you guessed it right,she had added a couple of tablespoons ragi flour to the dosa batter! I tried out a similar method for Pan Polo/Neer dosa with ragi flour and am very glad to say it turned out great. In a big mixing bowl,add ragi flour,salt to taste and enough water to make into a smooth paste. Keep aside for 5 minutes or so. Add more water[as required] to make the batter into a slightly watery consistency. [you could also pulse it in the mixer if there are any lumps]. In a seasoned dosa tawa,pour a ladleful of batter from the edges towards the centre to form a round shaped dosa[since the batter is watery,spreading dosa batter in the traditional way is not possible]. Let it brown on the sides and then fold the dosa into half then fold again. Serve hot with coconut chutney,pickle or coconut-jaggery mix. How did we like it - Except for the colour,the dosa tasted very close to its original counterpart Pan polo.Next time I am planning to grind together coconut and ragi flour and make a similar dosa as coconut imparts a very slight sweet taste to the pan polo. On a side note-This recipe was published on Hindu Metroplus in the feature My Grandmas recipe.Thanks to all of you who sent in their wishes for the same!! Sending this across to Srivalli's blog anniversary event Breakfast Mela! Congrats Dear:-) saw your recipe in Metroplus on Friday.. I hope u studied in st teresas . me too studied there ..
really proud of u dear. Ragi neer dosa!!! never had it. Ate neer dosa only once and loved it a lot. 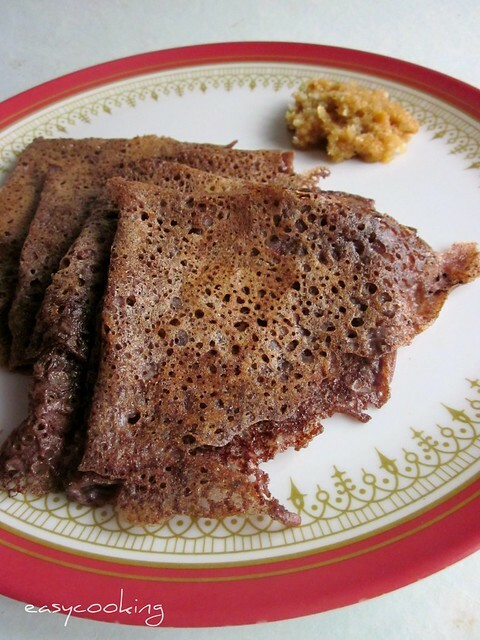 Will try this, loved your version..
yes,,even I used to add ragi flour to the batter, then now,I make similar dosas or even idlis with it..Have ragi idli in my blog.. Fantastic ragi neer dosa,cant wait to try.. I too make it but with combo of wheat flour,this sounds simple yet wholesome!! super dosa !! looks very healthy !! 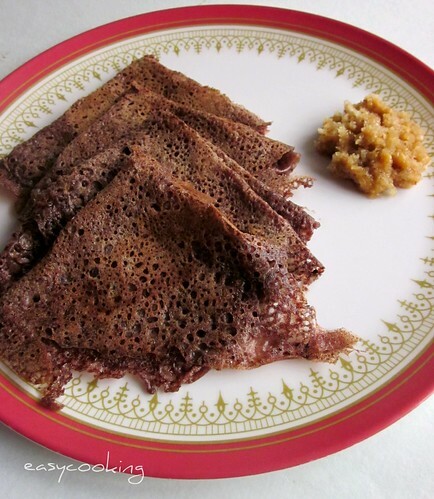 lol..its just that u did not post chocolate based recipe,but this ragi color is same as chocolate color..hmmmmm..I too make this...but I call this ragi dosa and yeah ragi neer dosa might b apt for dis..
Looks so good and tempting..love ragi dosa so much. Thanks for the lovely entry Divya, loved the picture when I saw it on Hindu..kudos on the publish..